As the old saying goes, ‘sticks and stones can break my bones’, but today, sticks and stones were just so good for the soul. 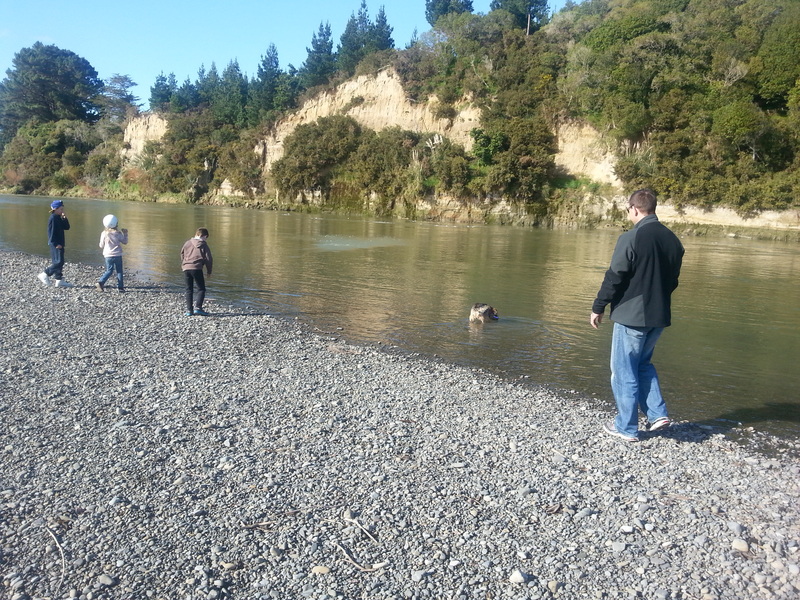 We wandered out on a perfectly clear winters day – Mr & Mrs with three of the kids and the dog – for a bit of fresh air, sunshine and exercise. As we live on the edge of town we’re so lucky to have a plethora of walking tracks at our doorstep. This morning we headed just 10 minutes away to the river. Mainly we thought the dog would love it but after half-an-hour there we all felt rejuvenated. Moe had a great time swimming and (attempting) to chase bigger dogs while the rest of us were seeking out random rocks and the weirdest pieces of driftwood, and skipping stones on the glassy water. There’s something so soothing about the sound of running water in nature. Not to mentioned the laughter of your children. Throwing stones across (or in my case, mostly into) the water, also strangely therapeutic. We’ve actually had a really great week, it’s not like anybody is even majorly stressed out but it’s ALWAYS good to regroup and just chill out. Something to be thankful for. Oh yes.